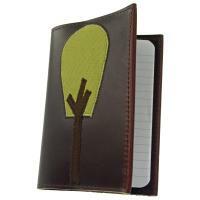 This sweet little journal features a tree stitched on the cover and is great for notes or sketches. It is small enough to fit anywhere and is made by hand in Lexington, KY from up-cycled leathers. We love this journal because it can be refilled with small lined notebooks from any office supply store and used over and over again!! The best gift for the conscious writer. Styles include bird, flower, geo, patch, and tree. Specify choice in Comments section or call store for current inventory. Colors vary. size approx: 6" x 4"